Adding a touch of elegance to your home has never been simpler with Andersen’s beautifully designed French Doors. A long time symbol of taste and class, and once only for the European upper class, French Doors are now available for homeowners who want to bring some old world charm and grace into their homes. Renewal by Andersen French Doors are the highest quality models on the market, utilizing advanced frames and glass packages to outperform and outlast the competition. When installed by a certified Renewal by Andersen retailer like Renewal by Andersen of St. Louis, your French Doors will be catching the eye of family and friends for years to come. The aesthetic appeal of Andersen French Doors stems from the detailed design work that has been perfected through the years at the Andersen production factories. Expert designers have poured their hearts into the design of these elegant doors, setting them apart from all other French Doors and ensuring that they add lasting beauty to any home. While they may not be the right fit for every existing décor, French Doors can be the start of a full remodeling. Our staff here at Renewal by Andersen of St. Louis will work with you to determine whether French Doors are right for your home. 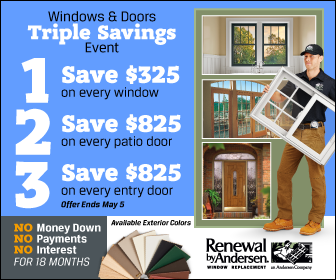 To learn more about Andersen French doors and Renewal by Andersen windows for St. Louis area homes, call Renewal by Andersen of St. Louis today or fill out our Request an Estimate form.